You all already know how I think Target is heaven on earth. If you needed more convincing, this was the best Target shopping trip ever. Where else can you get jumbo boxes of diapers, a free $20 gift card for buying said diapers, and a box of wine to help you deal with the beastie who needs the diapers in one fell swoop? 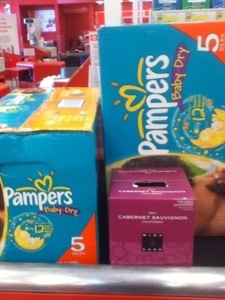 This entry was posted in Babies, Home Life and tagged Target by BrewsterMama. Bookmark the permalink.